There are a lot of foods that I think used to taste better years ago. I wonder if I would be correct if I actually could taste them again right now. I have a sneaking suspicion that my tastes have also changed. Some things will never taste the same simply because my tongue is not the same. I miss original Chocodiles, grape soda and BBQ sandwiches on a summer day when I was a kid, those cupcakes with the green frosting frog faces from Merrit’s Bakery in Oakland, and strangely enough, Diet Pepsi with lemon right before saccharine went out of fashion. Or get the bloody crap shocked out of you…. The first vanilla ice cream I ever had (1950 in San Diego) was amazing. Since then, I’d thought my tastebuds had just changed, when nothing else I found was like that. Couldn’t be the cattle renderings they add, right? Then in Altadena (at The Coffee Gallery, no less) I had some Fosselman’s, from a little family outfit in Alhambra. WHOAH. They still do it right! 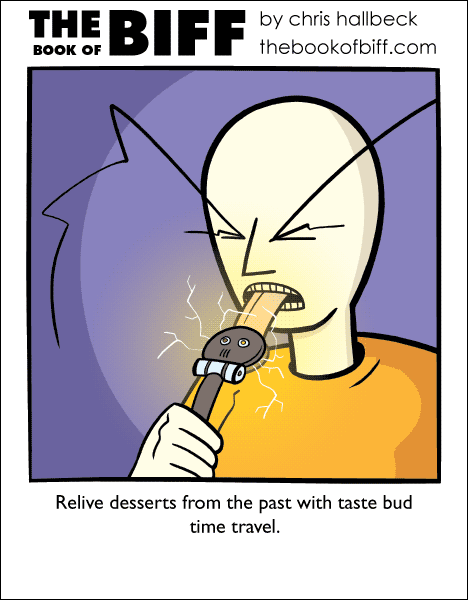 I used to lick watches when I was young. Would there be some sort of temporal disturbance if I use this product? Our taste buds die as we grow older, so our sense of taste changes. I can eat stuff now that I ran away from as a kid, that’s for sure. But I’ll still puke at the mere thought of any gravy, or “cream of” soups, or beans of any kind. You know that made me think about bananas, the species that we commonly eat today are not the same ones from the 1950’s, that species is now extinct. So they do taste different. Already working on this. Chronomancy is difficult, but progress is steady.